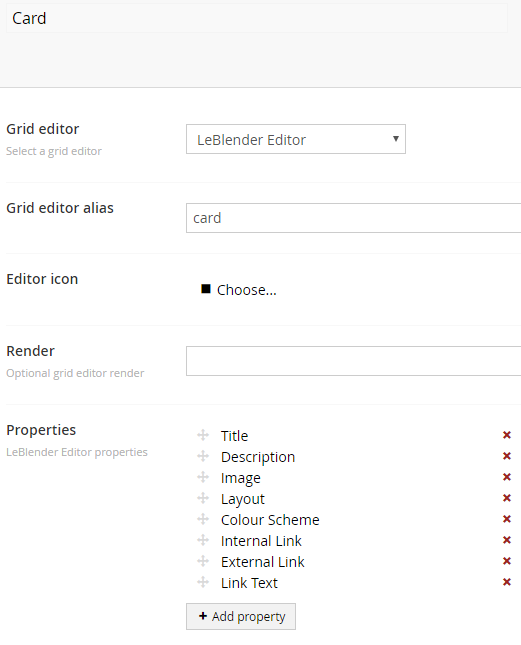 How to create custom grid editors for the Umbraco grid using LeBlender, an open source Umbraco back office extension. LeBlender is an open source Umbraco back office extension made that allows us to create new grid editors in a more flexible way. It brings an easy to use UI for you to add your own grid editors into grid.editors.config.js without having to change any JSON. We decided some properties would need to be customised datatypes to suit our customers' needs, like the colour scheme - they would only be able to choose from their brand colours. Here is where the magic happens! Rather than having to edit JSON you can add your properties here with the UI. Select the name, datatype, and alias and description and save. This edits the grid.editors.config.js and saves your changes. Now you can go back to your grid and select your new grid editor and its properties - but there's nothing showing up yet! We have to create a view for the grid editor. For this, I have gone into Views>Partials>Grid>Editors and created a new .cshtml view. This will get us the title property from our editor, and display it in a header tag. Continue to build your partial view with all of your properties in Razor, and you will end up with a completed grid editor!